We arrived at the Walrus and the Carpenter at 3:40 pm on a sunny Sunday afternoon and walked down a long hallway to get in line – the doors open at 4 pm and we were far from the first ones waiting. At 4 on the dot we were greeted with lively country music and escorted past the white-tiled open kitchen, which was dominated by giant steel baskets overflowing with oysters and ice, to our table facing a playful antler chandelier and an impressively large array of whiskeys sitting on a white bookcase. Named one of the top ten new restaurants in America in 2011 by Bon Appetit, the place was hopping and for good reason. 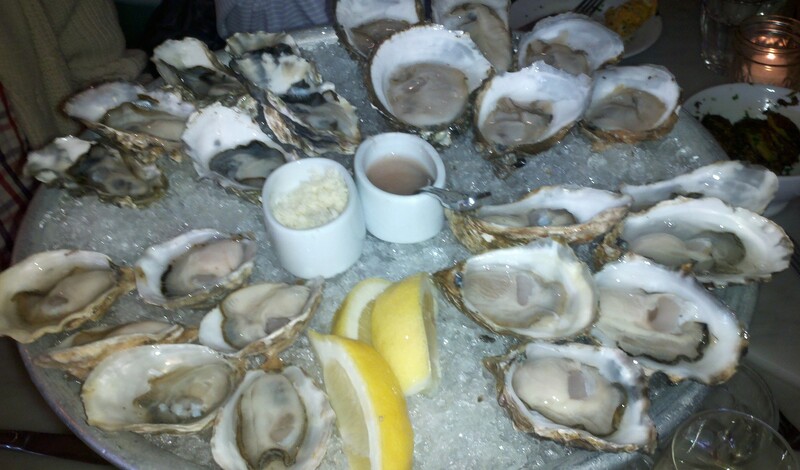 Sundays boast happy hour with half off oysters and discounted muscadet – a combination not to be missed. All of the oysters were local Washington state or British Columbia, each a different size and flavor, served with just the basics on the side – horseradish, lemon, and mignonette. After completing the necessary and delicious task of polishing off the oysters, we turned our attention to the rest of the menu, an inspired and creative mix of seafood dishes. 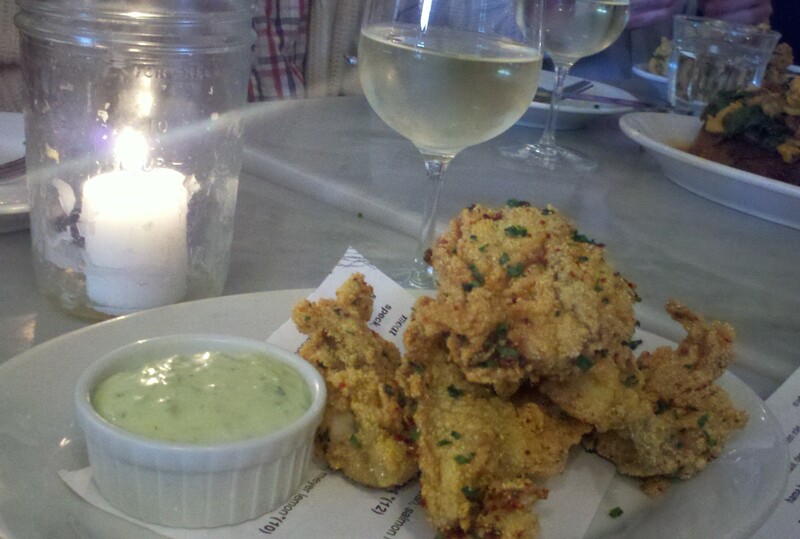 We couldn’t pass up the fried oysters with cilantro aioli, which were absolutely fantastic – sprinkled with a touch of cayenne on the outside, the ratio of oyster to light and crunchy batter was perfect in every bite. Next came a rapid fire set of small dishes, each uniquely flavored. We tried the smoked trout with lentils in crème fraiche, topped with pink lightly pickled onion, which artfully combined smoky, tart, and creamy flavors. After that was the halibut pickled in seaweed with whitefish roe and arugula – the arugula was an inventive choice that gave this dish an unexpected peppery flavor and made it distinct from other crudos or carpaccios I’ve had. The very trendy fried brussel sprouts with chives and sea salt were also a hit, with a burst of flavor and a mix of crunchy and juicy leaves. 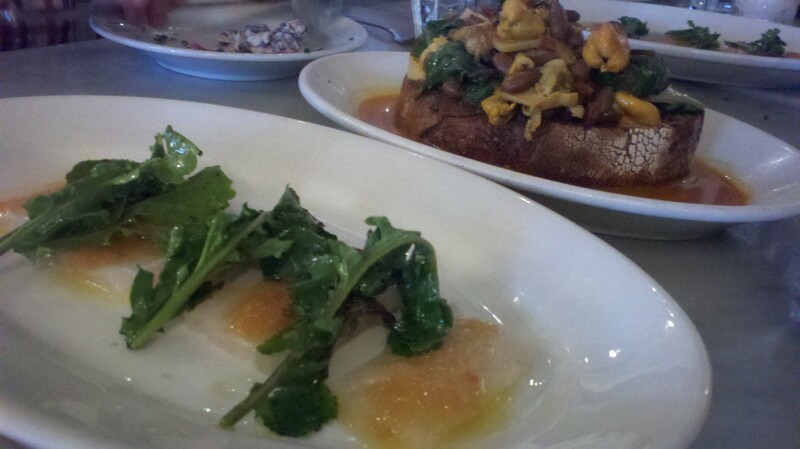 The table favorite was a mussel, spinach, and chorizo tartine on a chunk of brown country bread. The bright orange of the mussels, combined with the deep green of the wilted spinach made it beautiful to look at but the rich scent of the diced chorizo wafting off the dish meant that we couldn’t wait long before digging in. As if the meal hadn’t been enough, in the name of research we decided to try all four desserts on the menu – to be fair, there were six of us. My advice – use all available stomach space for the spectacular seafood, as it’s hard for anything else to live up to it. This entry was posted in Ballard, Dinner, Drinks, Seafood, Seattle, Small plates, Snacks and tagged Ballard, Dinner, Drinks, seafood, Seattle, Small plates. Bookmark the permalink. I was living in Ballard only a few months ago and never went here. I must go back and try all of this–it sounds delicious! Thanks! I hope you have a chance to make it there next time you are in Ballard – would love to hear what you think when you try it.